It won't be this close again for another 269 years. Put down your smartphones, look away from your smart watches. Right now, at this very moment, Mars is closer to Earth than it will be for a long, long time. And you should take a look at the sky for a change. If you do, you’ll get to see Mars up close for the first time since 2003, when it last made an approach like this. But don’t let that trick you into thinking this is a common occurrence. When Mars knocked on our door in 2003, it was the first time the Red Planet came that close in some 60,000 years, according to Space.com. And if you miss it this time around, you’ll have to wait another 269 years before it comes around again. The best view of Mars happened early Tuesday morning, but you can still see it Tuesday night, from anywhere in the world, if you simply look up. And unlike last summer’s solar eclipse, you’ll be a-okay if you want to stare straight at this floating red ball. Mars is particularly close to the Earth now because the two planets’ orbits are roughly in the same point in their orbit around the sun. This fly-by means that Mars, Earth, and the Sun are all lined up with each other. Because a Mars year and Earth year take different amounts of time, their orbits will soon desynch and the planets will separate. 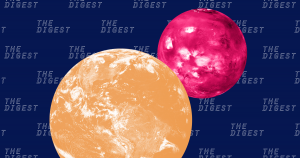 Mars will be lined up with Earth again in 2020, 2022, and 2025, but it won’t get quite as close to Earth as it did Tuesday (it was just 35.8 million miles (57.6 million kilometers) from Earth Tuesday morning, and will be 38.6 million miles (62.1 million km) from us in 2020, according to Space.com) because of oscillations in their orbits. So, we beg you: stop tweeting, stop playing Fortnite, stop reading this article, and just look up. Find that orangey-red circle in the sky that looks bigger and brighter than usual. Pause and marvel. You’ll be happy you did.